Have you spotted a potential damp problem? Our expert damp surveyors will get to the root of the issue and suggest an effective damp proofing solution. When you think you’ve discovered a damp problem in your home, it makes sense to call in the experts and get things checked out by industry professionals. Our damp surveys and inspections give you the peace of mind you need, safe in the knowledge that our experienced team will find the cause of the issue and offer an effective solution. If you’re unsure what the problem could be, don’t worry. Even if you’re not confident you have a damp issue, our team are more than happy to put your mind at ease. Our team members are fully qualified and trained in property surveying, meaning we can give you a fast and accurate explanation of what is wrong in your home. Having completed an assessment of your home or commercial premises, Croft Preservation will provide a comprehensive property report highlighting any areas of concern as well as those that may need immediate attention. Whilst we will always allow you to make the final decision, we will be on hand to offer personalised advice that takes into consideration your time and budget constraints – we’re here to help! We can also carry out any subsequent works for you as and when required but most importantly, we will always be honest and transparent in our assessments and pricing. 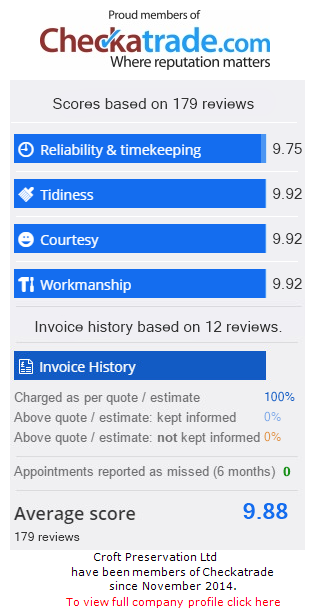 As a local, family-run company with a reputation built on trust, you can be confident using our services. Our surveys and inspections are available on all types of premises, so get in touch today on 01202 737739 to find out more.